William Turner (d. 1568) is justly famous as the first modern botanist and ornithologist in the United Kingdom. He compiled accurate lists of birds and plants in 1538. He wrote the first great English herbal, published in three parts between 1551 and 1568. Turner was also a nonconformist's nonconformist, always running afoul of the Court, his colleagues, and even his neighbors because of his religious and political views. He moved to the continent on several occasions in order to literally save his neck, because of his outspoken views on Henry VIII's (1491-1547) reforms and Mary I's (1516-68) campaign against religious dissent. Elizabeth I (1533-1603) welcomed Turner back to England, where he seemed to enjoy her favor. 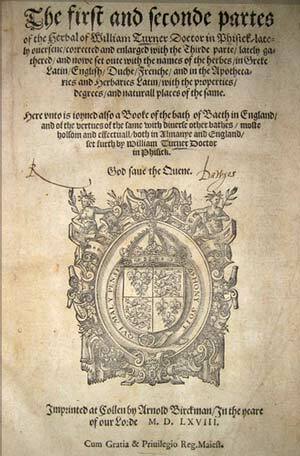 Turner, in the preface to his Herbal, indeed thanked Elizabeth, complementing her knowledge of "pure" Latin, remembering an encounter with her while working as a physician to the Duke of Somerset. The Lenhardt Library has an excellent and unique copy of Turner's heavily illustrated and well-written, even entertaining, Herbal in its collection. Turner wrote his Herbal in English in part to make its advice on the use of plants more widely available. He certainly was concerned that many of the herbals available in the middle of the sixteenth century were based on floras not readily found in the United Kingdom. He even described plants found in Europe along the Mediterranean. Misidentifications compounded health problems, rather than providing remedies. Turner, too, was not pleased with the dependence on ancient advice from Pedanius Dioscorides (40-90 C.E.) as interpreted by Pietro Andrea Matthioli (1501-77), who was the most famous physician on the continent at the time. The Chicago Botanic Garden copy includes a number of hand-colored wood engravings. The coloring in this volume probably was completed at the request of an early owner of the book. This colorist however took liberties in her work, as she added pen-and-ink illustrations of plants, delicately drawn and colored as well, in the margins of this work. Was the illustrator commenting on the lack of a specific engraving at a particular point in the text? Was she just taking advantage of the wide margins of the pages? We’ll never really decipher her messages some four and a half centuries later, but we can examine her additions and the adjacent letterpress to see if a pattern emerges. For example, on page 31 of the first part, there is an illustration in the margin next to the description of "henbanne" which we know today as Hyoscyamus niger. As a member of the Solanaceae family, henbane was known as a dangerous plant, which might explain why the artist added a drawing of it in the margin as additional red flag. The text itself notes it can "make men madde" which might explain the addition of the colored figure, with leaves, flowers, and roots all displayed quite clearly. We might guess that the colorist was taking some editorial liberties in enhancing the Herbal where necessary. The next illustration, on page 35, of "Alisson" (or known now as Alyssum) is not as a warning, but certainly as an aid in identifying a plant used, according to Turner, in healing the "bytinge of a mad dogge." I certainly would be interested in finding "Alisson" quickly if I had encountered a feral dog. An illustration would help! On page 40, another illustration appears next to the text for Amomum. This name was applied to several different plants by ancient and Renaissance authors, so it is difficult to understand which plant Turner is specifically analyzing here. He notes that he had a plant in Cologne (where he resided on one of his exiles) that was called by some the "Christmas rose" which he notes as the "right Amomum." In our modern reckoning, however, the Christmas rose, or Helleborus niger, is a very different plant from Amomum. The illustration is of little help, since it does not resemble a Christmas rose. The next added figure, next to the text for the bean Anagyris, seems to have no relation to the actual plant. It is followed by five uncolored wood engravings, as if the colorist lost interest in her project. We find the next customized drawing appears some ten pages later, with text describing Antirrhinum, otherwise known as snapdragons. To some, the flowers seemed to display the faces of dragons, so our artist faithfully added faces (more human than dragon-like) to the flowers of her illustration. Will we ever really understand these additions to this text? Probably not, but they provide a window into the mind of at least one reader of William Turner's Herbal. This book was one of the most important scientific works of its time in Great Britain, bringing medicinal information to a larger audience thanks to its use of the vernacular, its identification of readily accessible British plants, and its criticism of accepted herbal wisdom (most readily apparent in Turner's dismissal of myths regarding Mandrake). The charming colors of the wood engravings and the addition of many colored pen-and-ink drawings make this book a delight, even centuries later.